Techniques: Mix Rescue: War Kites, Understanding Speaker Stands & Platforms, Session Notes. Features: Fat White Family: Recording Songs For Our Mothers, Inside Track: Panic! At The Disco, Mixing Muse Live. This month we take a look at the updated GarageBand 2.1 and the Shure MV88 iOS microphone. A fully-weighted master keyboard at this price is unheard of. Is the KeyLab 88 too good to be true? The Amplifire promises great sound, plentiful options, ease of use — and the ability to load your own cabinet impulse responses. Designed by Sonicsmiths and released through Big Fish Audio, The Foundry is a Kontakt 5 virtual instrument that is aimed most obviously at sound designers. Heavyocity soar into orbit with a collection of dramatic scoring elements. Polish company IGS Audio’s Tubecore is back, with more facilities and more options. What’s not to like? Rhythmic Robot strike again — and with a double whammy! I can only speculate about this labour of love, feeding an Emulator II with a near–endless supply of 5.25–inch floppy disks. Soft-synth specialist Rob Papen has branched out into the world of processors — but his RP EQ is no ordinary equaliser. By concentrating only on the components that matter, Roswell have managed to create a classic-sounding mic with a budget price tag. 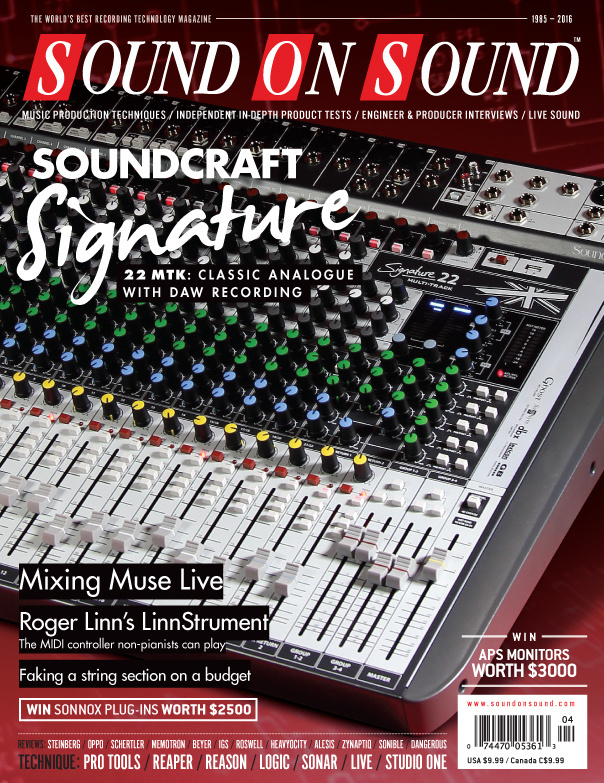 These files accompany the Sample Shop articles in the April 2016 issue of SOS. Schertler are no strangers to the art of amplifying stringed instruments, and their latest designs don’t disappoint. The first product from Austrian developers Sonible aims to raise the IQ of EQ. We’ve all had those ‘if only I could get rid of the drums!’ moments. Zynaptiq’s innovative plug–in promises to do just that. We explore the additive synthesis capabilities of Alchemy in Logic Pro X.
Reason’s Block feature is the key to turning loops and ideas into fully–fledged songs. Recording the centrepiece of Spiritualized’s celebrated space rock masterpiece took engineer Darren Allison on a trip into the unexpected. Live’s Simpler makes layering multiple sounds easy. War Kites: We help a talented indie band achieve a more polished sound from their home recordings. For 15 years, Marc Carolan has been in charge of the live sound for one of the biggest — and most technically ambitious — bands in the world. Reaper 5.11’s new Subprojects facility opens up entirely new ways of working. Hannes Keseberg: our engineer helps an artist fake a big-ensemble sound by layering recordings of a string quintet. Keep on top of fast-moving sessions with Studio One’s Layers and Versions. This month tracks from Krept & Konan, Fleur East, One Direction, Rod Stewart, Tame Impala and our Classic Mix is Britney Spears ‘Toxic’. I’m sure I recall being told that computers were invented in order to make life easier. While they can probably handle more calculations in a millisecond than I could in a lifetime, there are still aspects that are incredibly frustrating. Read more about Does Not Compute! We sit down with Chambers and producer/engineer Richard Flack (Joe Strummer, Rudimental, Paloma Faith) in Guy’s beautifully equipped Sleeper Sounds studio in West London. This month Aaron Gill suggests you focus on what you have. Many world-class recording facilities have built up their reputations over half a century or more. Clouds Hill, however, has risen to the top in a mere decade. Sound libraries are great, but making your own sound effects is more fun — and more individual. As the role of studios changes, so too must that of the new generation of studio managers. Media content for the April 2016 issue.